US Defense Secretary James Mattis said that the attack on the Kurds, who have cooperated closely with US forces in Syria, is "disrupting" anti-Daesh operations in Syria. French Foreign Minister Jean-Yves Le Drian also said that the conflict threatened to engulf the war-torn region in a new round of fighting. Brian Becker and John Kiriakou of Sputnik Radio's Loud & Clear discussed the Turkish incursion with guest Massoud Shadjareh, founder of London-based nonprofit Islamic Human Rights Commission. ​"It's really extremely puzzling," Shadjareh said of the situation. "Turkey, a NATO ally, is going against allies of the United States, another NATO ally. It seems both sides are supporting and fighting against the Kurdish element, and take control of this border to Turkey. They want to control a region 30 kilometers deep into the border. The Americans are saying that they want Kurdish control of that area, but both sides agree that the Kurdish have got elements which are recognized by both America and Turkish governments as a terrorist group, the [Turkey-based Kurdistan Workers' Party, or PKK]." "But if you go deeper into it, you realize what Turkey is actually asking for is something that they has been asking for for a very long time under different excuses. It was just around a year ago that Turkey wanted a safe zone that they would control, a no-fly-zone to defend the opposition against [Syrian President Bashar] Assad that is supported by Turkey. The reality of this would be to undermine the integrity of Syrian territories, and what the Americans are asking is a similar thing: different players undermining the integrity of Syrian territory." Becker asked whether, with Turkey fighting a US proxy in the form of the Kurds, there was any possibility of a military clash between Ankara and Washington. "It's quite possible," said Shadjareh. "We should also not forget the Kurds in Iraq had a crisis when they declared independence and Turkey responded very aggressively to it. All the regional neighbors found it very unacceptable." "Turkey, for a very long time, has failed to deal with its Kurdish population," Shadjareh said. 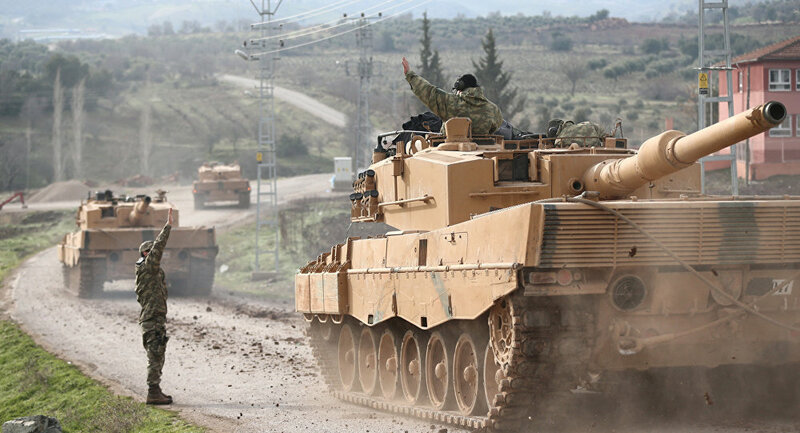 "Around three or four years ago, they decided to resolve this Kurdish situation with military means and start attacking the Kurdish areas within Turkey. So there is this militarized relationship between Turkey and its own Kurds, which identified themselves with the wider Kurdish community, which is partly in Syria, partly in Iraq, et cetera. I think that is actually one of the problems: until Turkey comes to recognize its own Kurdish population have to be dealt with politically rather than militarily, we have this problem." "There is a legitimate aspiration of the Kurds which has been undermined, probably more in Turkey than anywhere else. There was a time, around seven or 10 years ago, that we saw a different approach by Turkey towards the Kurdish population. We were looking forward to see the sums of political resolution, a settlement to the issue. They have a very genuine aspiration to use their own language, their own culture, and preserve it. They should have the right to do that." "But those aspirations are totally undermined by Turkey. Turkey is failing to address it in a realistic way, to find a political solution, which indeed is the only way to find a solution to it. Because of the chaos in Syria, they feel that they could actually go across the border and start attacking people, which at the end of the day is going to create a huge amount of suffering for the ordinary civilians in the area," Shadjareh said.